Grapevine tattoos seem to enjoy perennial popularity, but have you ever wondered why? There are actually plenty of reasons this design has withstood the test of time. Why are grapevines tattoos still popular after so many years? Maybe it's because they can convey so many ideas and meanings. Grapevines have always been associated with life's bounty, a sign of plenty. Consider the representations of the Roman god Bacchus, or his Greek equivalent Dionysius. These figures have seldom been seen without their accompanying grapevine crowns, cups overflowing with wine and plenty of grapes just waiting to make more. In a way, grapevines are symbolic of the celebration of life. As a subject, grapevine tattoos offer a great degree of freedom to both tat enthusiasts and the artists who ink the designs. Grapevine body art works on virtually any part of the body you care to wear it. Vine work can be gracefully draped around the neck for a collar, but it can just as easily wind its way up your leg from ankle to thigh. A bracelet of leaves and small grape clusters would look equally fabulous on the wrist of a man or a woman. Grapevines also work as larger tattoo pieces. It's easy to fill out a full sleeve design or even a larger back or chest mural by working in a few compatible elements. Grapevines enjoy their most powerful symbolism as a sign of rebirth and/ or new beginnings. Think about it: each spring, new green shoots spring up along gnarled, twisted old branches. It's like life springing from death. Grapevines are the plant world's version of the Phoenix rising out of its own ashes. When looked at from this aspect, a grapevine tat is a design that gracefully ages with you. Although you might originally conceive a grapevine design as a strictly purple and green venture, think about the many varieties of grapes there are. From light green through shades of red to the deepest blue-purple, grapes actually have a range of colors. There are also a lot of opportunities for shading in the vines and leaves. A truly talented artist can create a masterpiece that comes to life on your own flesh. By themselves, grapevine tats are beautiful, but they could still use a bit of added interest to keep the design from becoming monotonous. Luckily, vine work is compatible with a number of tattoo genres. Butterflies: A single brightly colored butterfly could really set off your design. Dragonflies: Dragonflies always seem to add an exotic flavor to tattoo designs. They are magnificent to watch in flight, but few of us ever get to study them up close. 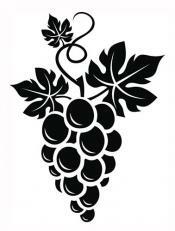 All the more reason to add one or two to your grapevine tat for more dimension. Ladybugs: Why not add a few of these good luck symbols to your plentiful vines? A design like this adds up to an overwhelmingly positive tattoo. If you believe in talismans, this body art could certainly portend good things. Tribal designs: Many popular tattoo designs are being recreated in the tribal style. In this case, your art would focus heavily on the entwined branches, and less on the fruit and leaves, although you might choose to place a single cluster of grapes in the center of your tat. Christian tattoos: The fruit of the vine is often interpreted as the blood of Christ in Christian symbolism. You might choose to back your grapes with a chalice or a cross as an expression of your beliefs. Celtic tattoos: Just as with tribal designs, a tattoo artist experienced in creating Celtic knot designs could create a set of knot work grapes and vines for your tattoo. There are plenty of places to gather inspiration for your own tattoo designs. Consider the tattoos and designs at the following websites and how you might use them to create original artwork for your own body ink.